Even Dennis Rodman laughs at the idea. “Kind of funny, huh?” he said. It’s true, though. One of basketball's most outrageous personalities has written a book for kids. The Hall of Famer’s book, “Dennis The Wild Bull,” came out Wednesday and fans will immediately recognize Rodman’s influence. The large red bull on the cover has flowing red hair, two nose rings, a tattoo and red stubble under his chin. “They’ll see me, literally see me. 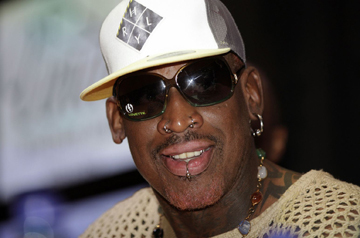 They’ll say, ‘Wow, this is just like him,’” Rodman said in a phone interview. “More than anything, I just want little kids today just to understand, ain’t no matter what you do in life, be different, rich or poor man, guess what, it’s OK to be who you are pretty much and you’ll be accepted,” Rodman said. Rodman already wrote books about his personal life — the wild nights as a player, relationships with Madonna and Carmen Electra, and everything that allowed him to be famous long after he finished winning five championships with Detroit and Chicago. The author whose previous works include titles such as “Bad as I Wanna Be” and “I Should Be Dead by Now” chose a different audience this time. He said even now he is still recognized by children who never saw him play, and those are the ones he wanted to reach. “For a guy like me to be very eccentric, to even go to extremes to write a children’s book with all the wild things I do and make it believable was pretty much incredible,” Rodman said. The book is available on Rodman’s website, www.dennisrodman.com, and Amazon for $16. His web site also has information regarding upcoming book signings in the New York area and Chicago.